The creeping wild rye is a cool season grass with upright green blades that reach 2 ft. high. It has summer and fall inflorescences that reach 3 ft. tall, and it spreads by rhizomes. 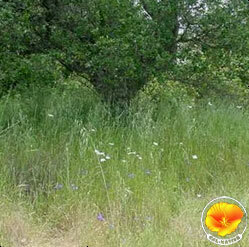 The creeping wild rye is native to California, is drought tolerant, and is a beneficial insect plant. -Cornflower Farms This grass is extremely aggressive and should only be planted in areas where it will be able to spread without concern. Most often used in revegetation.